The GT-906A60 is a unique 10/100/1000Base-T to 1000Base-LX / SX Managed Media Converter that has the ability to meet the demands of enhanced applications. The GT-906A60 features plug and play technology along with versatility between 10/100/1000Mbps media on the unit’s RJ-45 port. 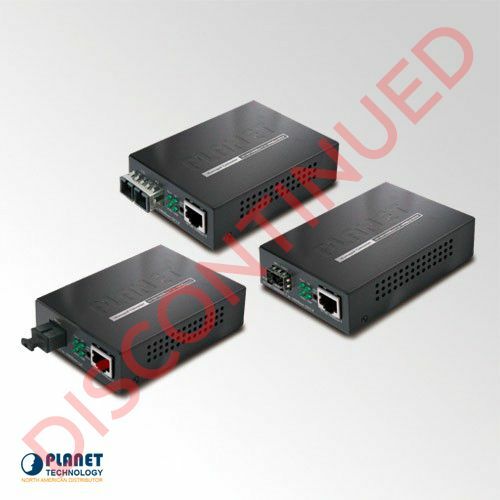 The media converter features a very stable Gigabit fiber performance and allows for conversion on 10/100/1000Base-T and 1000Base-LX / SX networks. The GT-906A60 features remote Web and SNMP interfaces to allow for simple user-friendly management. The Web-based management allows the unit to operate efficiently as a sole platform for management and configuration. The unit also supports SNMP and can be managed through standard-based management software. In addition, the support of theTS-1000/802.3ah OAM protocol allows the GT-906A60 to manage remote devices. The GT-906A60 can be efficiently configured for advanced management functions including the following: IP address configuration, DHCP Client function, port configuration, converter configuration, 802.1Q Tag VLAN, Q-in-Q VLAN, Ingress/Egress bandwidth control, QoS and Layer protocol filter, broadcast storm and bandwidth control. Since the GT-906A60 complies with IEEE 802.3 10Base-T, IEEE 802.3u 100Base-TX, IEEE 802.3ab 1000Base-T and IEEE 802.3z 1000Base-LX / SX, installation is even more simple with plug and play technology. The unit can also be used with a media converter chassis from Planet Technology, models MC-700, MC-1000 and MC-1500. The unit offers DC power to the GT-906A60 to ensure that the fiber-optic network remains at one location.